A collection of prisoner of war and concentration camp survivor stories from some of the toughest World War II camps in Europe and the Pacific, this book details the daring escapes and highlights the fundamental aspects of human nature that made such heroic efforts possible. 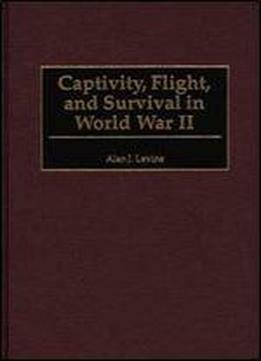 Levine takes a comprehensive approach, including evasion efforts by those fleeing before the enemy who never reached formal prisoner of war camps, as well as escapes from ghettoes and labor camps.Levine pays particular attention to dramatic escapes by small boat. Many are not widely known, although some were made over vast distances or in fantastically difficult conditions from enemy-occupied areas. Accounts include attempts at freedom from both German and Japanese prisoner of war camps, stories that reveal much about the conditions prisoners endured. Some of these escapes are far more amazing than the famed Great Escape from Stalag Luft III. German and Austrian prisoners also recount their amazing flights from India to Tibet and Burma. This study challenges some ideas about behavior in extreme situations and casts ting light on human nature.